I really like this card. I don't know why. It feels like a better Ainok Guide. I don't usually want to put a land on top of my deck, but when I do, I really want to. The Ainok made me feel bad when I had to play a 2 mana 1/1 in order to do it. That being said, for some reason I am just assuming that the land I want is in the top 3 cards of the deck. If it wasn't in the top 8 cards of your deck is has got to be close right? I wonder if we will get evolving wilds in limited, probably not with all of the gates. Well it is any land, not just one of the ones you just dropped, so it seems usable in self-mill. Stitcher's Supplier into this means 6 cards in your grave so you should be able to grab at least one, and if it drops a bit late you'll likely have more options. 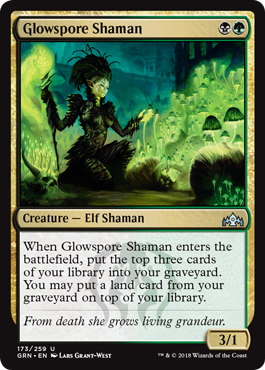 I feel like Golgari or Sultai Self-Mill could be a real potential-though maybe not super top tier but also maybe really good-deck archetype. And look if it gets pushed enough that Muldrotha could see Standard play I'd actually be pleased because that'd be interesting.